Marvel has released Guardians of the Galaxy’s teaser trailer, exhilarating comic book, action-adventure, and sci-fi fans alike. We don’t have to wait too long for more footage, as Jimmy Kimmel Live will release a longer trailer tonight. Directed and written by James Gunn (co-writer of Scooby-Doo and Dawn of the Dead), Guardians of the Galaxy presents a story of a pilot, Peter Quill, who faces multiple challenges after stealing a highly sought after orb. Oh, and all this happens deep in the far reaches of space, marking Marvel’s first foray deeper into the interstellar side of its comic book stable that was touched on in Thor: The Dark World. (Check out some of our early coverage of the film for a deeper look into exactly who the Guardians of the Galaxy are.) Peter Quill is played by Chris Pratt, well known for his role as Andy in Parks and Recreation Series, Paul in Her, and Emmet in The LEGO Movie. Pratt is not the only star to look forward to here, as Bradley Cooper, Vin Diesel, Zoe Saldana, Dave Bautista, Lee Pace, Benicio Del Toro, Djimon Hounsou, and Glenn Close will also work alongside him. This action packed teaser trailer will likely draw interest to the release of the trailer soon to come. 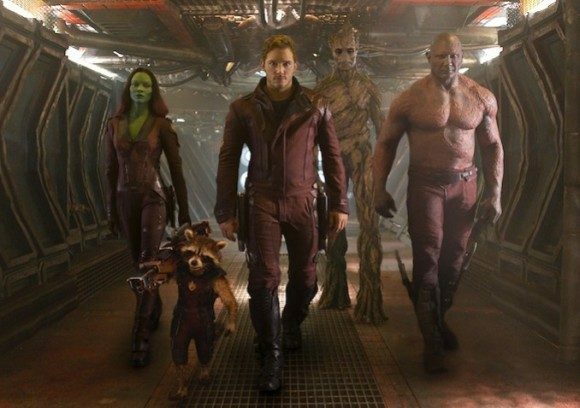 Guardians of the Galaxy aims to throw audiences into orbit August 1.